Franch, X.; Guizzardi, R.; Guizzardi, G.; López, L.
The i* community has raised several main dialects and dozens of variations in the definition of the i* language. Differences may be found related not just to the representation of new concepts but to the very core of the i* language. In previous work we have tackled this issue mainly from a syntactic point of view, using metamodels and syntactic-based model interoperability frameworks. In this paper, we go one step beyond and consider the use of foundational ontologies in general, and UFO in particular, as a way to clarify the meaning of core i* constructs and as the basis to propose a normative definition. We focus here on one of the most characteristics i* constructs, namely means-end links. Franch, J. [et al.]. 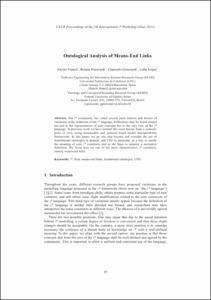 Ontological analysis of means-end links. A: International i* Workshop. "iStar 2011: proceedings of the 5th International i* workshop: 29-30th August, 2011, Trento, Italy". Trento: CEUR Workshop Proceedings, 2011, p. 37-42.